Usage labels help administrators annotate environments, templates, and assets for more detailed usage reporting. After a label is added to a resource, the label appears in usage reports whenever that resource is used. The label data can be used for accounting chargebacks, cost allocation, and usage trending analysis. Labels are visible only in downloaded CSV (Line Item) reports. For more information about generating a CSV reports, see Viewing usage data. Because labels are primarily designed for administrative reporting, labels are tightly defined by administrators. Administrators must create label categories, work with their users to apply labels to resources, and then create usage reports with label data. (Admins) - Administrators create label categories; these become the column names that appear in usage reports. 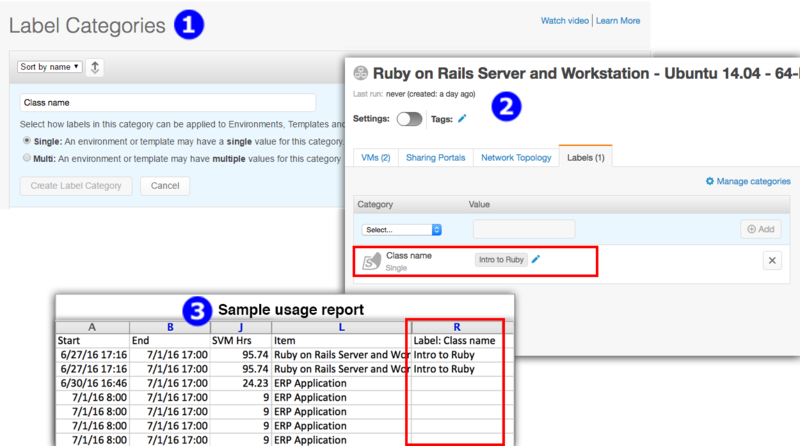 For example, an administrator can create a new category called CLASS_NAME to start tracking usage by training class. For instructions, see Creating usage label categories. (Admins and users) - Administrators and users attach labels to resources. For each label, users select from an existing label category and then add a label value. For example, a user can add CLASS_NAME: INTRO TO RUBY to associate an environment with the “Intro to Ruby” class. For instructions, see Adding and removing labels for VMs and other resources. (Admins) - Administrators generate usage reports with label data. Administrators can sort, filter, and group data using labels. For instructions, see Generating usage reports. Training – Labels can distinguish different classes, regions, products, training types, and students. Dev/Test – Labels can indicate internal projects, teams, builds, stacks, customers, products, and releases. Demo – Labels can identify products, version, customer, sales rep, and regions. When creating label categories for chargebacks or cost allocation, use the Single label category type. Single value label categories give you the cleanest reporting, as users can attach only one label in this category per environment, template, asset, or schedule. Multi value label categories are better suited for general reporting (for example, to group environments by applications in use). Administrators should communicate appropriate value-naming guidelines to users so that users don’t create several values that mean the same thing (MySQL, database, SQL). After you start typing a label value, Skytap autocomplete suggests matching values that are already in use. To automatically add labels to new resources, add the label to a schedule or to a template. When the schedule creates or runs an environment, or creates a template, it automatically adds its labels to the environment or template. An account can have up to 100 active label categories. An account can have a maximum of 200 total label categories, including all active, inactive, or deleted label categories. This limit is reduced by the number of active labels categories. For example, if there are 88 active label categories, your account can have 112 inactive or deleted label categories. Each resource can have up to 30 labels. A single label is a label category + label value pair (example: PRODUCT NAME: PRODUCT A). If you have multiple values in the same category, each category + value pair counts as a label (example: PRODUCT NAME: PRODUCT A, PRODUCT B would count as 2 labels). The maximum length for a label category is 128 characters. The maximum length for a label value is 255 characters. Label categories and values can’t include semicolon (;) or comma (,) characters. Asset labels and schedule labels must be added and removed via the REST API. Although you can add labels to individual VMs, they aren’t used in reports. Only Multi value label categories can be used on VMs. You can’t change a label category type once you’ve created the label category. Skytap supported ten predefined label categories. If your resources used those labels, those labels have been migrated to the new schema.